Endoscopic third ventriculostomy (ETV) is one of the most recent advances in the treatment of obstructive hydrocephalus. Subsequently there have been a number of publications which have established its role in neurosurgical practice, particularly in hydrocephalus. ETV has become the standard surgical procedure for treatment of non-communicating hydrocephalus. ETV is a quick and simple minimally invasive procedure with less morbidity and mortality compared to standard ventriculoperitoneal (VPS) shunt placement. This procedure, however, requires a general anesthetic and necessitates manipulation of the brain neural structures to access the floor of the third ventricle. 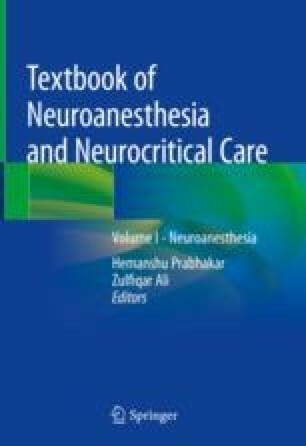 In this chapter we are going to focus on ETV sciences in terms of history of ventriculoscopy, endoscopic ventricular anatomy of the third ventricle, surgical technique, and anesthetic considerations of ETV.